DAYS after suffering a major heart attack and as he lay in a hospital bed wired to monitors facing a bypass operation, a Wirral dad was phoned and told he must continue a government work programme. Colin Rogers, 58, from Irby, had been admitted to Arrowe Park Hospital and then transferred to Broadgreen, in Liverpool, after suffering chest pains. His wife, Carol, said she was later told he was moments from death as his heart failed and then specialists said he must undergo a quadruple heart bypass operation after he was taken ill on September 27. Yet, days later – despite his wife informing the Job Centre of her husband’s condition and asking that this be passed on – as he lay in bed in hospital he received a call about his place on the Government’s Work Programme, delivered by public services company A4e. Colin, who had worked for Champion Spark Plugs until the factory closed and he was made redundant, was told by a manager from A4e that he was committed to the work programme he had been signed up and would have to continue it. Colin, who came out of hospital a few days ago, said: “I couldn’t believe that they were ringing me because I had given my wife a list of people who needed to be told and she had contacted the Job Centre and told them A4e needed to be informed what had happened to me. So I was completely shocked and I said to the guy I couldn’t believe he was phoning me, that he was supposed to have been told that I had a heart attack. BENEFIT sanctions have been dubbed as “pure evil” after a woman had to steal food and groceries to feed her family when her money was stopped. Lucy Hill, of Westcott Road, Kidderminster, was caught taking chicken and washing powder from a Spar store on October 1, after first stealing more meat two days earlier. The 35-year-old’s Employment Support Allowance had been sanctioned after she missed an appointment at the Job Centre and her defence solicitor, John Rogers, said it was “necessary that she committed this offence” for the good of her partner and their 18-month-old baby. And now the public have rallied behind her agreeing they would have to steal as well in her position, with Kate Bennett from the Wyre Forest Citizen’s Advice Bureau saying sanctions are doing more harm than good. ESA claimants in the work-related activity group, where an adviser assists them with training and skills, like Hill who was convicted of two counts of theft which she said was a result of the suspended payment at Kidderminster Magistrates’ Court on Thursday, October 16, are subject to sanctions. These are handed out for failing to attend a mandatory interview or failing to take part in a work-related activity. In the district in the last 12 months, there has been a 30 per cent increase in the amount of people getting their benefits sanctioned. “People who have tax payers’ money should do all they can and have to to get it but we should be helping people like this woman,” Ms Bennett said. MPs are to hold a new inquiry into the government’s brutal benefit sanctions regime – following a campaign backed by the Daily Mirror. It has been triggered by Labour MP Debbie Abrahams, who called on the Work and Pensions Select Committee to investigate after the Government refused an inquiry. The move follows a 200,000-strong petition set up by Gill Thompson in July following the death of her diabetic brother David Clapson at the age of 59. David, a former soldier who served in Northern Ireland, died destitute after being sanctioned by the Job Centre for missing a single meeting. 1) THERE IS NO EVIDENCE THAT WORKFARE SCHEMES LEAD TO EMPLOYMENT. 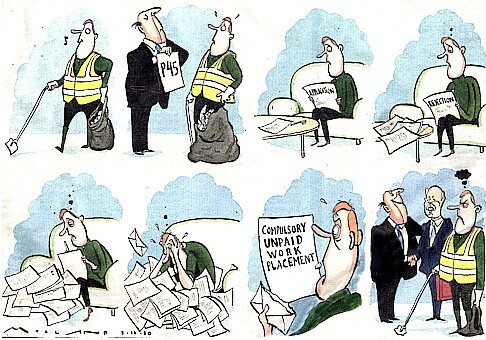 Workfare schemes have been tried out in countries such as Australia, USA, Canada and places in Europe since the 1990’s, with dismal results. Research in Australia found that workfare had an insignificant effect on reducing long-term unemployment and was “ineffective” in finding sustainable employment. So what stopped you from killing yourself, then? I accompanied someone to an Atos assessment today. His documentation mentioned that he had suicidal thoughts. The assessor asked a series of very probing questions that I was very uncomfortable with. He wanted to know what actual actions my friend was planning when he thought of suicide, how and where his suicide attempts were made, what stopped him from going through with it, what he was thinking about, why he was so depressed. The upside of this was that after 20 minutes of this the assessor said he had enough evidence and did not need to ask about my friend’s other conditions. I am hoping there was enough there to get him put straight into the support group, where he needs to be. But I am very concerned now about his state of mind after the assessment. In cases like this a person is being put at immediate risk by talking about things that are very distressing to someone that is not even a mental health practitioner, or they will not get the benefit that they need. Should I have intervened and challenged the young man asking these questions, and run the risk that my friend would fail the assessment because he had not convinced the assessor? I’d greatly appreciate people’s comments on this. What the heck is this? I’ve been trying and failing to stop the government from privatising the National Health Service for years, and now a private healthcare company has contacted me about a job! So Gittings dipped into an emergency fund she has created to pay for a bus pass for both mother and child. She set up the fund a few months ago with £500 of her school budget, £500 from her parent-teacher association and £500 from the church. She knows she can’t continue to pay for their travel though: one adult and one child bus pass for a month comes to about £100. So eventually the child may be forced to move to a new school.